Village of Wellington, a painting by Archibald Willard, 1857. Image used courtesy of the Herrick Memorial Library and Ohio Memory. One of the hard parts of illustrating the history of this area prior to the advent of color photography is obtaining compelling images to help tell the story. While black and white photographs can provide an excellent record, works in color are, to my eyes, much more attention-grabbing. They make me feel like I'm actually there. I came across this painting ages ago - I'm not sure how I managed to forget about it. 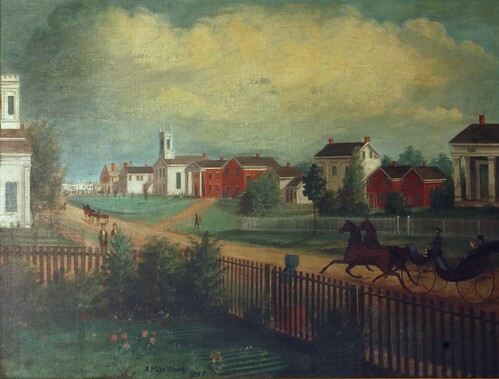 The canvas, painted by Archibald Willard in 1857, depicts the village of Wellington, in Lorain County. The Spirit of '76, a painting by Archibald Willard, 1916. Image used courtesy of the Herrick Memorial Library and Ohio Memory. 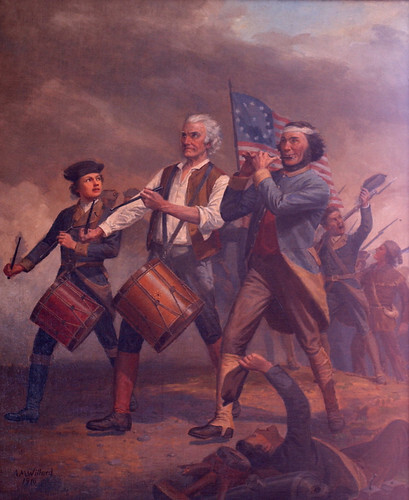 Archibald Willard, a native of northeast Ohio, is best known for the patriotic painting, The Spirit of '76, which he painted several versions of - the first being for the 1876 Columbian Exposition. Willard's painting of Wellington illustrates a view of a city that still resembled a New England village, with rows of houses and a couple churches facing a central green. His vantage point was from the corner of Magyar Street, looking north on Main Street. Wellington retains the village green, and some of the structures shown in the painting. Large trees now growing on the green prevent one from attempting to capture the same angle today. Archibald Willard's rendering provides a way to visualize the historic appearance other town centers throughout the region. I grew up in a historic victorian home in Wellington just a couple of blocks from the town square. I remember going to the Marblehead Massachusetts town hall where one employee boasted tha they had the original Spirit of 76. "Which one?" The woman looked at me like I was stupid. I explained that Williard painted several Spirit of '76 and that the last one that I saw that claimed to be "the original" Spirit of '76 was hanging in the Fayette County Courthouse in Washington C.H., Ohio, and that they too thought they had the original. But I have to say this, Marblehead's painting is the largest of them that I have ever seen. If I am correct, the model for the drummer boy as painted was the son of Henry Deveraux. I believe his name was Julian French Deveraux. His grandfather was Julius E.French who owned both a Schweinfurth mansion on Euclid Ave. and a large country estate in Wickliffe - " Nutwood Farm"
although there is a discrepancy ... It has been stated in other documents that in fact the Senior Deveraux was the "model" in this portrait. "Old Orchard Farm" on Mentor Ave., Painesville. Christopher, you have photos of all residences in your photo blog ! It was in fact the senior Henry Kelsey Deveraux who was the model for the drummer boy in the original Willard painting from 1876. Known as Harry, he was requested as a model by Willard while attending the Brooks Military Academy. After graduation he married " Socialite Mildred French, daughter of Julius E. French, Euclid Ave., Cleveland. I am very curious about his property Nutwood Farm, Wickliffe as well as Old Orchard Farm, Painesville. My Greatgrandfather, George Herman Roush, was employed as a dairyman for the Nutwood Farm for more than twenty years. He and his wife Clara Ethel Lewis and her extended "Lewis" family (parents Wm. Henry and Mary Ann Earley Lewis; sister-in-law Anna Louisa Lewis Taylor; nephew Herman Taylor; niece Mary E. Taylor) all, at various times, resided upon and sometimes worked on the farm. There were "company" houses along Bishop Road that served as rentals to farm employees. Number 1350 Bishop Road. rented for twenty-five dollars per month back in 1940. At that time, a Dairyman's salary was just eight-hundred and fifty dollars per annum. I should also mention that he put in seventy hour work weeks. Do the math. 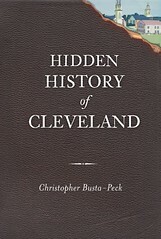 Many of Herman's descendents still live in the Cleveland area. For me, Pepper Pike is both steps and worlds away from my family's very humble beginnings in Wickliffe. Thank you Grandpa Roush! I hope that the Deveraux family fared as well!